Wetsuit Surfing – How it All Began – All Things SURF! We, at Encinitas Surfing highly recommend the following wetsuits for quality, comfort and function. Click on the image links below for purchasing details. In the early 1950s, Bob Meistrell started wetsuit surfing in Northern California. Twenty minutes was about all anyone could tolerate in the nearly freezing coastal waters. Even with the rush of adrenaline, and three or four waves later, the Body Glove co-founder was heading back to the beach for the warmth of his car. Water temperatures near Santa Cruz are in the mid-50s, and one can catch hypothermia in about an hour. This is in sharp contrast to popular myths of early American surf-culture, usually including skimpy swimsuits and suntanned skin. Bands like the Beach Boys and films like Annette Funicello’s “Beach Blanket Bingo” created an image that revolved around southern California warmth. The truth is, most beaches on the California coast were simply too cold for surfers to get their surfing fix, inspiring pioneers like Meistrell to start developing creative solutions for effective wetsuit surfing. Picture above is an early 1950s ad for EDCO’s sub-mariner wetsuit. True to his word, Bradner formed the Engineering Development Company, or EDCO, with some colleagues in order to manufacture his “Sub-Mariner” suit. As quoted in an ad from Skin Diver magazine, a short version of the Sub-Mariner sold for $45, which would be approximately $400 today, while the full suit cost $75. Regardless of price, Bradner’s company couldn’t compete with brands developed by the actual athletes who used wetsuits, like surfer Jack O’Neill. The same year that Bradner’s company got started, Jack O’Neill opened the first O’Neill surf shop in his garage near Ocean Beach in San Francisco. O’Neill had been testing various methods to keep warm while surfing off the Northern California coast. He would soak sweaters in kerosene to make them more water resistant and experiment with rubber drysuits worn by Navy frogmen. The two-part frogmen outfits were sealed at the wrists and ankles to prevent water from entering the suit, and worn over long underwear to stay warm. 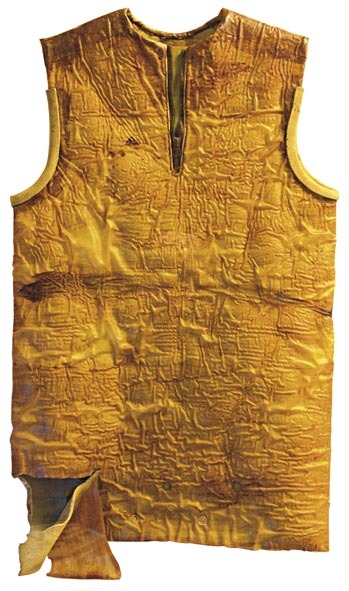 O’Neill’s earliest wetsuit prototype was this vest coated in PVC plastic, circa 1953. “You’d be good for half an hour before the seal would break and the waders would fill with water, lucky to survive. He’d be surfing at Ocean Beach basically in rubber overalls filled with water. Frightening. The drysuit would let O’Neill stay in the water a bit longer, but he realized it was not a safe solution. A while later, O’Neill got wind of neoprene from a pharmacist friend.. O’Neill applied a thin layer of PVC plastic sheeting to one side in order to strengthen the material. He then hand-cut neoprene panels to the desired size. O’Neill constructed and tested his first wetsuit designs himself. In 1956, O’Neill introduced the wetsuit to a wider audience: At a sporting goods trade show in San Francisco. He had his kids float around in their full-length wetsuits along with surfboards, inflatable rafts, and big chunks of ice in a swimming pool. The orders started rolling in. During this time, down in Redondo Beach, Bob Meistrell and his twin brother Bill were experimenting with their own wetsuit designs. The Meistrells were mesmerized by the ocean, and first attempted diving in a local pond using a vegetable-oil can as a helmet rigged up with a bike pump to deliver fresh oxygen. Fresh out of high school, the boys were drafted to join the Korean War effort in 1950, with Bill heading to South Korea and Bob to the Fort Ord base in Monterey, California. After Bill returned from Korea, the brothers became two of the first certified SCUBA instructors in the state. However, years after they’d fallen in love with the sea, they still could not stay in the cold water for long. As luck would have it, their friend Bev Morgan had been introduced to Hugh Bradner while he was doing research at Scripps. Morgan created his own wetsuit prototype based on a design Bradner shared with him, and continued making them for surfer friends like the Meistrells. A late ’50s ad for Dive N’ Surf’s “Body Glove” wetsuits. But most surfers weren’t sold on the benefits of wetsuits, and many continued to brave the cold waters without one. Early designs often restricted mobility, and their rough rubber interiors irritated the skin. Additionally, the thick neoprene material and lack of zippers made them very difficult to put on, so much that the Dive N’ Surf crew would host contests to see which surfer could get in and out of their wetsuit the fastest. Until that happened, the wetsuit had a bit of stigma attached to it. “For a while, they said only sissies would wear wetsuits,” Meistrell pointed out. Though not for long, as Bill began searching out a lighter, stretchier material, which took him back to the headquarters of Rubatex in Bedford, Virginia, to learn about their different rubber products and work with the company to produce the best possible wetsuit fabric. By the 1960s, surfers were familiar with the wetsuit-clad Body Glove surf team. 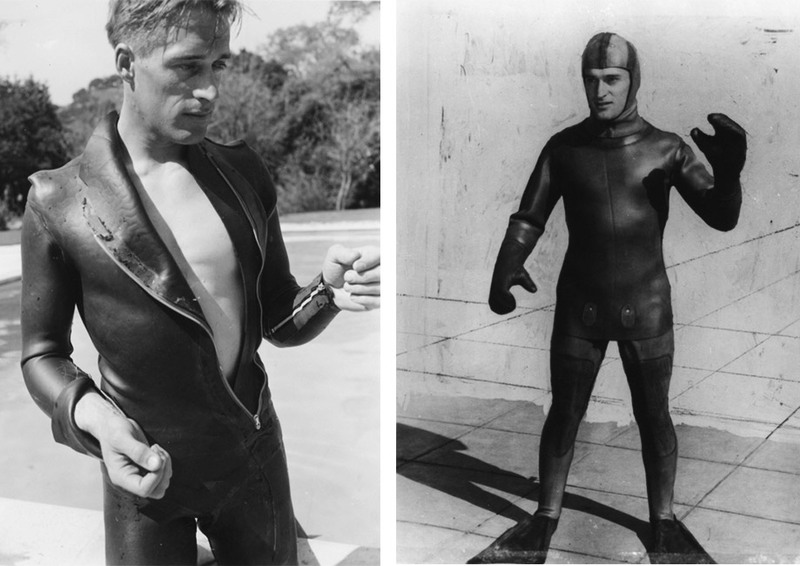 The brothers produced their wetsuits for anyone who needed them: Professional divers, military personnel, film actors. PLEASE LEAVE ANY COMMENTS OR REACTIONS TO THIS BLOG POST BELOW.